The air-cooled DC motor of this electric fillet knife depends on a portable DC battery power pack which snaps into place with the same convenience you'd find in any good modern portable power tool. One fully-charged power pack should handle the entire day's catch, but the cordless set includes a backup pack just to make sure. Charging one battery pack fully takes about four hours, so remember to juice up the batteries before the fishing trip, not after. The fillet knife switches easily from the six-inch serrated blade to a more capable seven-and-a-half-inch blade, letting you work with precision on fish of different sizes. Although the knife is fully warranted against defects for two years after purchase, Rapala does warn against overtaxing the air-cooled motor. Built for intermittent use, the Rapala fillet knife should be allowed to cool if you feel the motor or power pack overheating. It's possible to block the cooling vents in the handle while working, and that does exaggerate the problem. Both the stainless steel blades and the battery packs are replaceable items but should be long-lived if used correctly. The set comes in a compact molded plastic case, making the entire kit -- two blades, two power packs, motorized handle, and charging station -- easy to take along on trips. 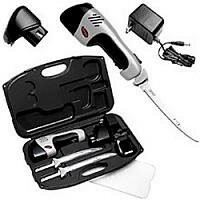 See the Rapala 110VAC fillet knife for a less expensive, lighter, corded version of the electric fillet knife.